Les Alpes D'Azur, were formerly the “Albergo Americano”, an 1882 Italian inn on the French border. 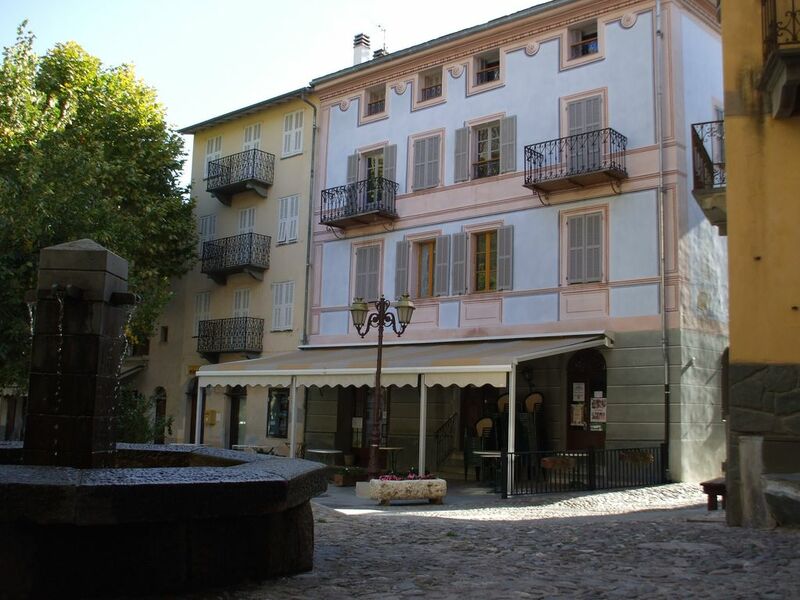 They overlook Place de Nice, the main square in La Brigue, and have stunning mountain views. There are two apartments, each of which has been renovated, modernised and fully equipped. They are owned by two families who visit regularly. Apartment One (39 square metres) is on the second floor and has a double bedroom, shower room and living/kitchen room with small balcony overlooking the Place de Nice. There is an electric hob, oven, fridge/freezer, Hi-Fi and TV. There are wooden floors and, with windows on three sides, the apartment captures lots of sun. With a sofa-bed in the living/kitchen room, Apartment One accommodates 2 to 4 people. Both apartments have electric heating included in the rental price as well as wood-burning stoves in the sitting/kitchen rooms. Linen is provided. Our apartments, 'Les Alpes D'Azur', overlook Place de Nice, the main square in La Brigue, and have stunning mountain views. There are two apartments, with one and three bedrooms. La Brigue is one of France’s most lovely mountain villages and a curious mix of Italian and French. Set close to the border in Alpes-Maritime, La Brigue is superbly situated for stunning mountain hikes and views, climbing and the unusual sport of via ferrata, canoeing, rafting and canyoning, skiing and snowboarding ,visits to the seaside. La Brigue is situated right on the edge of the Mercantour National Park; 25 minutes to the excellent ski resort of Limone Piemonte in Italy; 45 minutes to the coast at Ventimiglia; under an hour to Menton and Monaco and 80 minutes to Nice. Les Alps d'Azur apartments are located in Place de Nice, a large square with interesting buildings including some with ‘trompe-l’oeil’ façades, and a shaded terrace café, the Café des Platanes. I am Graham Wason. My wife and I enjoy our holiday apartments in La Brigue and hope you and your family will enjoy them too. Clean, well-equipped and a great setting for a walking holiday. Some lovely walks nearby and many a short drive away. Truly a spectacular setting. We stayed for a week in the larger apartment with our two children and had a simply magical time. The Mercantour and La Brigue really have to be seen to be believed - the pictures barely do them justice and can't convey the way that the smells of provencal herbs fill the air on every mountain path. The location is perfect especially if you want to take small children on walks which are not too taxing for them but nonetheless feel dramatic and properly mountainous. The village and Tende are lovely, the people are friendly, the food is great and the apartment is very attractive and comfortable. On very hot days then just playing in the river or in the swimming pool at Tende kept the children happy for hours. We wished we had planned to stay longer and hope to return soon. We loved the apartment. Mountain views from front and back. Good hot showers when we arrived back from the walks. We did light the wood burning stove one night as it was a little chilly. We had no problems with parking or noise but I expect it may get a little more exciting in August. A little sad to say but I did need my internet fix. Used my mobile tethered to my laptop in the apartment no problem but this can get expensive. The Auberge Saint Martin – 150 metres down the road has good wi fi. The apartment was nice and comfortable. It had everything we needed. La Brigue is an amazing community; all the locals were extremely helpful, even with our very limited French/Italian. All the owners of the restaurants and the market were pleasant and very friendly. The apartment is perfect for those looking for quiet, hiking/nature vacations. It was everything I had hoped for and I would most definitely recommend to others. Thank you so much for your kind comments. La Brigue is indeed a wonderful village - right on the mountain border between France and Italy. The apartment, town and area were all fabulous. The apt is spacious, well laid out, comfortable, well equipped and superbly located. Having the wood burner made even rainy days enjoyable, reading on the fabulously comfortable settee and looking at the view out of the window. There is so much walking in the area, including from the door. The train is a 10 minute walk away and is a great way to get around. The double shower was a bonus - it was powerful with plenty of hot water. La Brigue is lovely with restaurants and small shops for buying supplies. I couldn't fault it and would highly recommend it. I cannot think of one single critisism. I will most definitely book again. Great apartment, great customer service, great location and great price. What more can I say?! Manque de confort, abattant des toilettes sales, tâches sur les draps , matelas du canapé sale , matelas de chambre tâchés !!! Oreillers jaunes de crasse! We have been letting this apartment for 17 years. We reject all of these assertions. We provided the phone number of Maria who looks after the apartment in advance, and in the apartment, but there was no attempt to contact Marie to discuss anything that was not right. We do not recommend this client to any reputable property owner. Nous avons laissé cet appartement depuis 17 ans. Nous rejetons toutes ces affirmations. Nous avons fourni le numéro de téléphone de Maria qui s'occupe de l'appartement à l'avance, et dans l'appartement, mais il n'y avait aucune tentative de contacter Marie pour discuter de tout ce qui n'était pas juste. Nous ne recommandons pas ce client à n'importe quel propriétaire de propriété réputé. La Brigue is located in the Vallee de la Roya, which runs north from Ventimiglia (45 mins) into the Alps near Tende. Due to its location in an east-west side valley, which follows the course of the River Levense, La Brigue is one of the sunniest villages in the area. It also avoids the traffic on the main road two kilometres away. It nevertheless has a bustling life of its own. La Brigue was Italian until local residents voted in a plebiscite to become French. Street names are Italian and local language and culture are French mixed with Italian. There is a very nice 'epicerie' opposite Les Alpes d'Azur, run by Cedric and Maryse, which sells just about everything including fresh baguettes and croissants. There is another grocer nearby, an excellent butcher, a post office and several restaurants in La Brigue, including the ever-popular 'Pizzeria Brigasques'. There are three starting points for skiing at Limone. By far the best is Limone 1400 - all ski areas, with a good mixed range of runs, can be reached from here. To get there you turn off to the left just after the Col de Tende tunnel – only 25 minutes’ drive from La Brigue. There is plenty of parking but at weekends in high season it’s best to arrive early. There is a good ski school and skis can be hired and stored inexpensively. There are several mountain restaurants and bars. Limone Piemonte is another 5 minutes’ down on the Italian side. It is a very pretty town, but at times there is only one lift up from the bottom, which can get crowded. However there is a train from La Brigue to Limone Piemonte, should you ever need an alternative to the car. We like skiing at Limone. It is a popular day visit area for people from Monaco, Nice and Ventimiglia as well as Turin. It is quieter and more ‘local’ than the ‘big name’ Alpine resorts. There is also cross country skiing.